Package Include:1 black apple watch case + 1 silver apple watch case + 1 rosegold apple watch case . Special Advantage:our apple watch case do not have the line flaw around the case edges. pectfect electroplate design makes your watch looks more High end and Durable. would never become fade and yellow. Haha, get this watch case for your iwatch now. Material: Soft TPU case give you fine touch feeling, this apple watch case cover the full front and curved edges of the iwatch , protect your apple watch from scratches, drop, bump and so on. 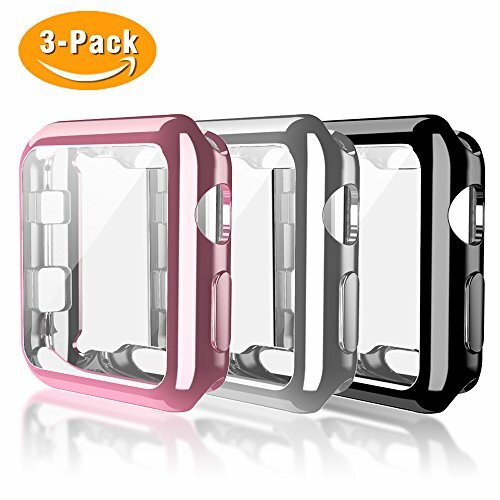 99% high transparency, still responsive to touch with this case covering your watch. Special Advantage: our apple watch case do not have the line around the case edges. pectfect electroplate design makes your watch looks more High end and Durable. Would never become fade and yellow. Application: Design for 38mm and 42mm Apple watch Series 3,Series 2,Series 1.very easy to put on and take off. Your watch could be charged with the case on. Package Include: 1 clean cloth and 3 pack of this case.